As bikes get more and more travel-happy, components and accessories have to evolve to keep up. Saddles, though, are largely immune to changing bike design -- a saddle's a saddle, right' WTB disagrees, and so it teamed up with Chris Cocalis, the founder of Pivot Cycles, and Dave Weagle, inventor and namesake of the DW-Link suspension, to designed the High Tail Team Saddle specifically to accommodate long-travel bikes that might otherwise buzz your saddle when the suspension is fully compressed. By shortening the saddle to 255mm and including a rear cut-out, WTB made sure the High Tail won't get buzzed on bikes with compact rear frames, big wheels, and plush suspensions. A shorter tail also makes it easier to get your weight off the back when you're descending, and WTB's signature DNA padding and responsive-but-comfortable Flex-Tuned shell provide personalized and high-quality comfort. At 200g, the Team isn't as light as the carbon-outfitted version of the High Tail, but it will leave your wallet a whopping $100 heavier and it still checks in at 25g lighter than the cromoly-railed High Tail Pro. 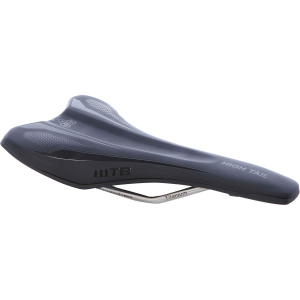 While the High Tail was made with DH and enduro riding in mind, it's light and comfortable enough to work as a trail or road saddle, so don't hesitate to throw it on your ride of choice.